Rome Monument is a nationally recognized mausoleum construction company, mausoleum contractor, mausoleum builder and installer with over 80 years of experience as a design/builder of high quality private family mausoleums for cemeteries and memorial parks. Rome Monument also designs and manufactures community mausoleums and columbariums. We design, build and install single crypt mausoleums, two crypt mausoleums, walk-in mausoleums, above ground burial vaults, private estate mausoleums, family mausoleums, chapel mausoleums and garden mausoleums for families throughout the United States. Rome Monument also sells community mausoleums, private columbariums, church and community columbariums, crypts, urns and niche nameplates and plaques. Rome Monument is one of the leaders in the cemetery monument and memorial industry. Browse pictures of 1 crypt mausoleums, 2 crypt mausoleums, private family mausoleums and stately walk-in mausoleums in this PDF guide. Learn how Rome Monument designs and builds elegant mausoleums using high quality granite, impeccable construction standards and old world craftsmanship. Get an understanding of the customization and ordering processes. Learn about high-grade granite, mausoleum foundations, base courses, architectural options and landscaping considerations. We draft mausoleum design plans using CAD software and present these drawings and renderings to our clients for approval before beginning construction. The mausoleum construction drawings we produce and submit to our clients include precise dimensioned architectural plans, structural plans, electrical plans and mechanical specifications. We present out customers with construction contracts that define how much it will cost to build their mausoleum. 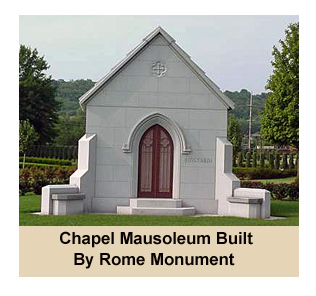 Click here to view pictures of mausoleums designed and built by Rome Monument. If you are want to know how Rome Monument designs and constructs high quality family mausoleums, watch the video titled "High Quality Mausoleum Design and Construction Overview". In this video, Rome Monument shows you how to tell the difference between high quality mausoleum and low quality mausoleum design and construction. In addition to a superior, professional design, the quality of a mausoleum depends on such factors as the reputation of the granite quarry, the quality of the granite, foundation, base course, side walls, roof and joints, among other construction elements. Our rigorous and meticulous mausoleum construction standards ensure the following safeguards and customer service requirements. The video below shows you examples of custom designed private family and estate mausoleums for sale by Rome Monument. It also explains how you can order or purchase a completely customized private family mausoleum from a Rome Monument Showroom in Pittsburgh and Western Pennsylvania, or from your home anywhere in the United States. Once designed and constructed, the mausoleum is delivered, assembled and installed in the cemetery of your choice. You can order, buy, purchase and commission a Private Family Mausoleum with any number of crypts in different styles, shapes, sizes, and price ranges. In the video show above, Rome Monument takes you through the steps on how a mausoleum is designed and built. It follows the construction of a Greek Neoclassical-style mausoleum for the Pappan family of Pennsylvania that was installed in Beaver Cemetery, Beaver Pennsylvania in 2015. Rome Monument is a mausoleum construction company, mausoleum contractor and mausoleum builder with over 80 years of experience as a design/builder of private family mausoleums for cemeteries and memorial parks. The Pappan family took advantage of Rome Monument's Pre-Arranged Cemetery Monument Plan - pre-need planning that allowed the Pappan family to pre-design, pre-plan and pre-pay for a truly high quality, completely customized monument prior to their passing and according to their wishes. The Pappan family met with Rome Monument who drew up designs and detailed plans for the structure. The main portion of the mausoleum was constructed with American Gray granite. The blue pearl granite door was sculpted with crosses to symbolize the Pappan family's Christian faith. The two memorial benches in front were made from blue pearl granite. The mausoleum design incorporates classical architecture by using fluted turned ionic columns as one element. The family name carved above the entrance features polished hand tooled raised letters. The mausoleum rests on a triple base course of granite. The roof stone is accented with decorative molding. Rome Monument took about one month, on-site in the cemetery, to complete the construction. The complete mausoleum required 4 large truckloads of granite. Many of the components were prefabricated in the production facility before being assembled on-site. We rigorously followed mausoleum construction standards during the construction of the mausoleum. You can see aerial video footage of the Pappan Family Mausoleum in the video below titled "See Inside Large Mausoleums Built for Famous Americans". Wikipedia says that a mausoleum is an external free-standing building constructed as a monument enclosing the interment space or burial chamber of a deceased person or people. A monument without the interment is a cenotaph. A mausoleum may be considered a type of tomb, or the tomb may be considered to be within the mausoleum. Some of the most famous mausoleums in the world include the Mausoleum of Augustus, Grant's Tomb, Lincoln's Tomb, Saints Peter and Paul Cathedral, Tomb of Cyrus, Hamilton Mausoleum, Palmer Chapel Mausoleum and the Lenin Mausoleum. If you want to see inside large mausoleums built for famous Americans, watch this video. Other famous mausoleums located around the globe include the Anıtkabir, Humayun's Tomb, National Pantheon of Venezuela, Qianling Mausoleum, Ho Chi Minh Mausoleum, Castel Sant'Angelo, Tomb of Jahangir and Mausoleum of Genghis Khan. They are some of the most elegant pieces of architecture on the planet. A very interesting article about famous mausoleums was written by Douglas Martin for the New York Times is titled "Deathstyles of the Rich and Famous". The term “mausoleum” comes from the Mausoleum at Halicarnassus, the grave of the King Mausolus, who was a prominent Persian ruler during the 4th century BC. Other notable and famous mausoleums include the Mausoleum of Mohammed V, Mausoleum of Hadrian, Kumsusan Palace of the Sun, Artigas Mausoleum, Imam Husayn Shrine, Royal Mausoleum of Mauretania, Mausoleum of Diocletian, Holy Cross Mausoleum, Bourguiba Mausoleum, Mausoleum of the Shirvanshahs, Shah-i-Zinda, Great Pyramid of Giza, Terracotta Army and the Taj Mahal. Another interesting story about mausoleums was written in 2015 by Adam Selzer. It is titled "Touring the Tombs: The Mysterious Mausoleums of Chicago’s Abandoned Cemeteries". Louis Henry Sullivan, a mentor to Frank Lloyd Wright designed the Martin Ryerson Tomb (Egyptian Revival Style) and the Getty Tomb, both of which are located in the historic Graceland Cemetery in Chicago. The mausoleum for Carrie Eliza Getty is a great example of Sullivan’s architectural style. Learn how people commission the design and construction of a mausoleum. Learn more about private family mausoleum designs and to see modern family mausoleum design pictures. Learn more about the Pappan Private Family Mausoleum. Learn how much it costs to build a mausoleum. Rome Monument Expands Installation Area Across U.S. In January of 2019, Rome Monument, a mausoleum design and construction company based in Pittsburgh, purchased two new custom monument trucks. The private family mausoleum builder now has the manpower and equipment to deliver and install high quality single crypt, two crypt, walk-in family mausoleums and multi-crypt above ground burial vaults in all 48 states. Both of the new mausoleum installation trucks purchased by Rome Monument use truck-mounted articulating cranes to set and install granite mausoleum foundations, walls, roofs, doors, crypts and heavy stones. Rome Monument is currently very busy manufacturing and building mausoleums purchased by private customers in large cities and wealthy communities all across the continental United States. Private family mausoleum prices start at $15K. Some of the new mausoleum installation areas in the United States are listed below.